I’m all about easy and healthy lunch ideas that take minutes to prepare and are convenient to transport to work, school or just on the go. 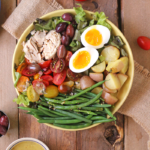 Today I’m teaming up with my awesome friend Candice from The EdgyVeg to turn your traditional lunch favourites like egg & tuna salad and giving them a vegan makeover, 2 ways! I’m going to be sharing my vegan egg salad recipe and Candice is whipping up one of the best vegan tuna salad concoctions I’ve ever tried! This is one of the easiest lunch recipes I’ve ever made and I promise you it actually tastes and looks like the real deal. Most vegan egg salad recipes use tofu but I really wanted to provide an option that uses ingredients you probably already have in your kitchen. The mixture of chickpeas and white kidney beans creates the perfect texture that actually resembles egg. 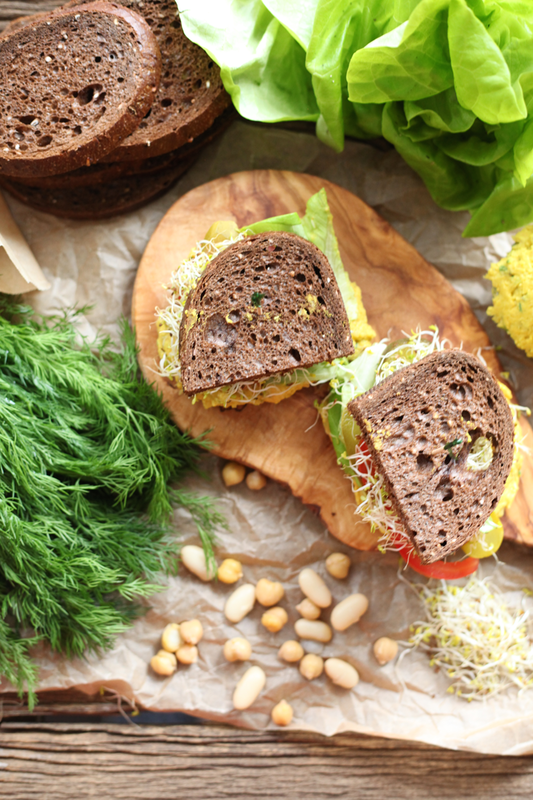 The first option is a lemon and dill flavour on dark rye bread. Which if you haven’t had fresh dill in your egg salad before you must try this version. Fresh dill in general is amazing and I add it to a lot of things like salad dressings, dips, and whatever else I can manage to sprinkle it onto. 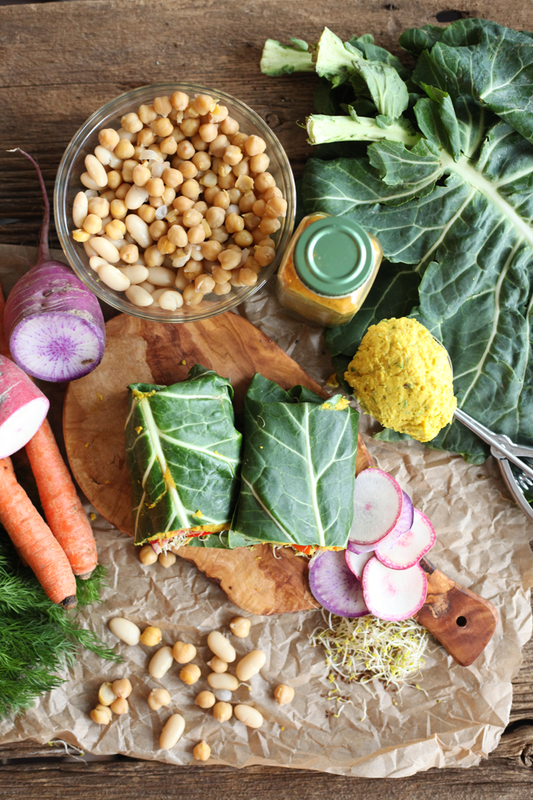 Option #2 is a curried egg salad version in a collard green wrap for some extra green power. A lot of people don’t think about adding curry to egg salads but its another combination that works really well. I mean curry is yellow, egg salad is yellow… seems logical to me, right? 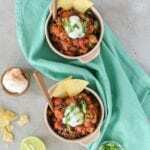 With both of these versions you can really add any veggies you like so go ahead and use whatever leftovers you have in your fridge and create some food art! 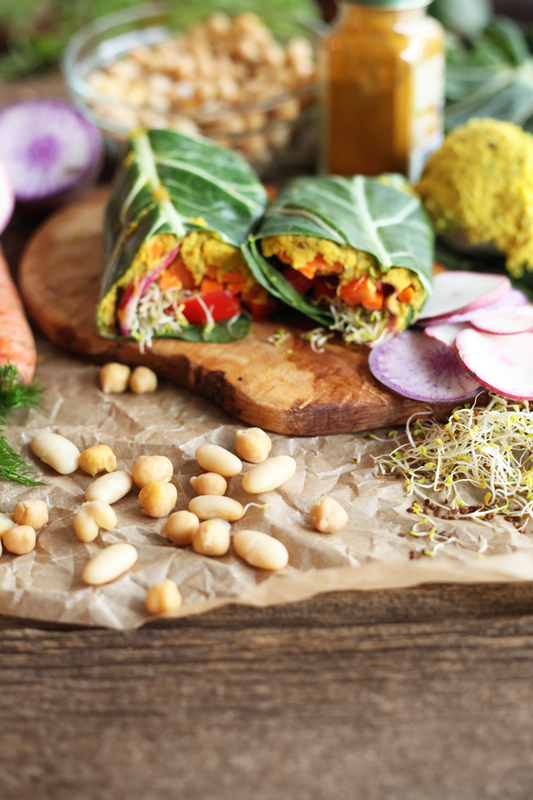 Want some more healthy vegan lunch options? Don’t forget to check out the vegan tuna salad we made over on Candice’s channel HERE! 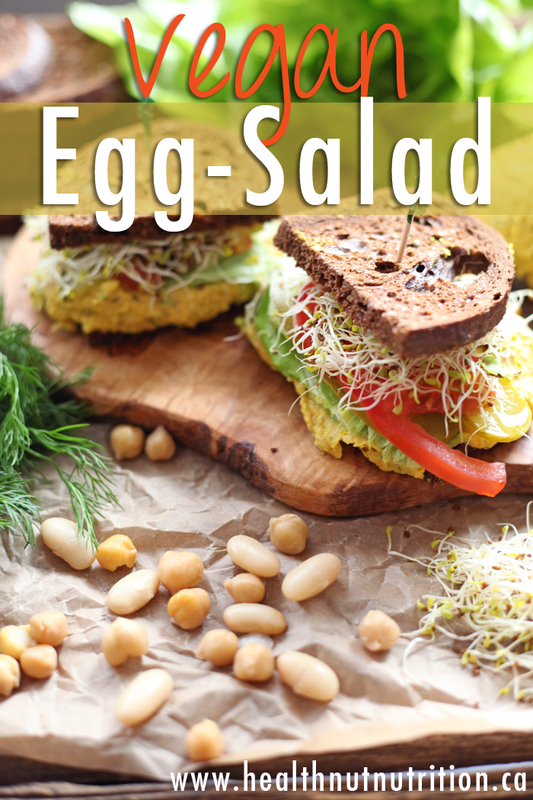 An easy tofu free vegan egg salad recipe. Place all ingredients into a food processor and pulse for roughly 15 seconds until smooth with a bit of texture. Next, assemble your wrap or sandwich with desired toppings and enjoy! *Best when stored in an airtight container and refrigerated overnight. I’ve never been a huge fan of egg salad sandwiches! What turned me off from them even MORE was their mayo sauce! Now that you made a healthy and vegan version, I would love to try it out! I have never liked egg salad, I find it icky! But I just made this egg salad, so delicious!! Can’t wait to let it sit in the fridge tonight, let the flavours grow and eat it tomorrow. Overnight in the fridge is key to make this recipe taste even better 🙂 Enjoy! 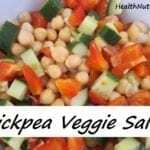 What other beans could be a substitute for Chickpeas?? maybe lentils? I havent tried it yet though. 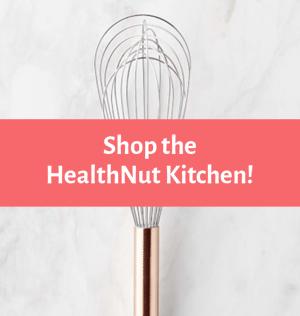 Currently, I do not own a food processor, will my vitamix do the job? 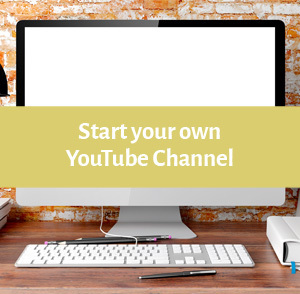 FYI I am asking about the vegan egg salad receipe…thanks! 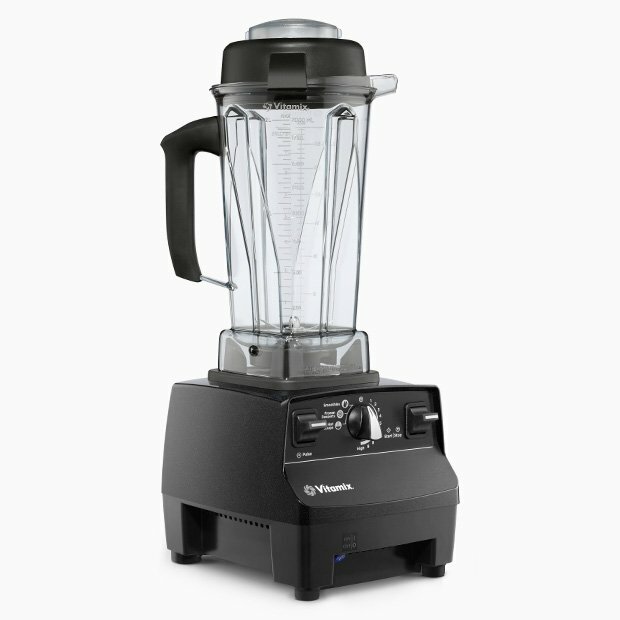 Currently, I do not own a food processor, will my vitamix do the job? FYI I am asking about the vegan egg salad receipe…thanks!! I would just mash it by hand since a vitamix might puree it to much. I just made your Vegan Egg-Salad and it was delicious. 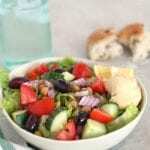 Do you have a vegan tuna recipe? 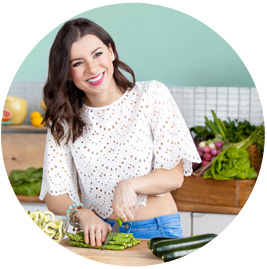 Check her YouTube video with the EdgyVeg. They make vegan Tuna salad. Super tasty! Thank you. This is going to be a fabulous lunch at work tomorrow. 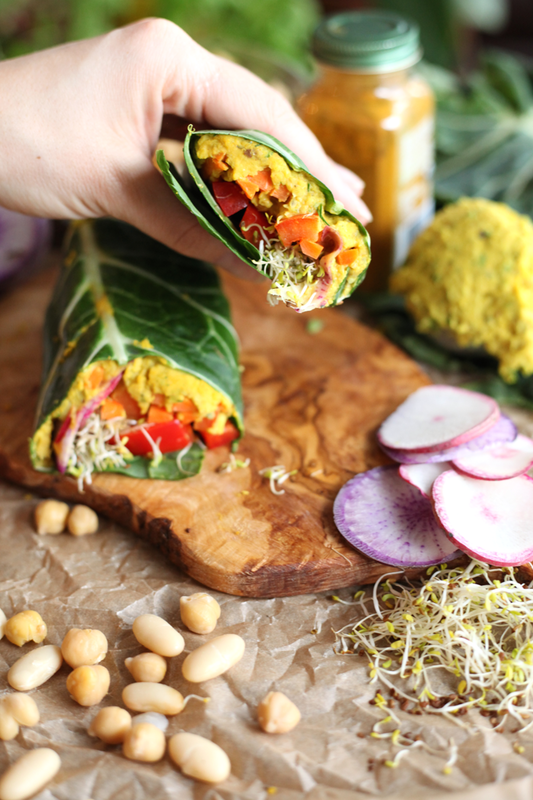 We made the curry version on a collard green wrap. Yum! How long can the eggless egg salad filling be kept for? This was delicious! I try to avoid added fats, so I used an additional 1/2 cup of cannellini beans that were thoroughly creamed. Overnight in the fridge really lets the flavors marry. Thanks for the yummy lunch idea! I love it it’s so good and easy to do for my kids for lunch today thank you.